The forecast history now has row entries for “nearby” trades that changed the chances of this question. In the Testing screenshot below, the top two forecasts (most recent) are regular power-mode forecasts changing this question’s chances from 81% -> 1% and then from 1% to nearly 100%. Nothing new there. But the next two forecasts aren’t forecasts on this question at all. They are mere shadows of forecasts on related questions Q.102 and Q.103. But those questions are correlated with this one, and the trades were big enough to move our estimate a little bit: first from ~80% to ~79%, then from ~79% to ~81%. The first (bottom) forecast is also a shadow forecast: @jkominek made some large forecast on Q.341 which moved our estimate from 18% to 13%. There is a potential gotcha! here: the “Old Forecast” and “New Forecast” now always show the unconditional chances — the same chances tracked by the Trend graph. (Power Users: don’t worry, you will soon be able to toggle information overload.) Oops, not in this release. Old and new are still conditional when assumptions are made. You can now say a few words while you forecast. Overly verbose comments may be trunc…. In early November, we will being a 4-month incentive study with prizes. Look for the Au symbol and an associated leaderboard. Stand by for details. This entry was posted in Updates and tagged combo, leaderboard, prizes, related questions, Shadow Forecasts by ctwardy. Bookmark the permalink. 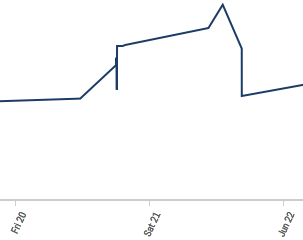 the unsmoothed trend graphs are sort of noisy now. that said, the internet of things graph is interesting. yeah. thinking of adding a trend line and/or semantic zooming when we switch widgets in the next couple of weeks. might go one step at a time. I strongly prefer the unsmoothed trend graphs. I also prefer the unsmoothed plots. Even if they’re messy, they are better at showing the full range of trading prices. That said, I could see myself being convinced otherwise. We’ll keep the unsmoothed line available. Might make it lighter and add a bolder smoothed trend. A bit more work would start that zoomed-out so each day is just a vertical bar showing the range. Zooming in would reveal the unsmoothed. Two comments: (1) I think it’s the case that when someone edits question A which links to multi-outcome question B, the new style “Trends and History” table for B shows the effect of the edit on *each* outcome of B. This is good. The same format for reporting the effects of @jkominek’s auto trades would be useful. (2) Since the update, the leaderboard has been frozen. Transient issue, or bug introduced by the patch? (1) Yes we plan to extend the multi-choice format to other forecasts including automated trades. (2) Fixed now, thx. One more question. I noticed a HUGE jump in my available points recently. My only explanation for this is that the recent release fixed the issue of points locked up in outcomes that are already impossible (i.e. those which admin has zeroed and locked). Is that the case? No, but we did resolve a lot of pending questions. Huh. Surprising that (as we can see now that Brandon has restored the leaderboard-update cronjob) resolving these pending questions had such a big “PnL” effect, both on total score and available. It indicates to me that those forecasters who were ultimately correct on these questions were, by and large, very underconfident. Or perhaps most of these questions closed while the issues were actually still very uncertain? Looking forward to the next blog post on Brier scores and calibrations!